Since the mid-1970s, the colloquial term zone has often been associated with the troubled post-war housing estates on the outskirts of large French cities. However, it once referred to a more circumscribed space: the zone non aedificandi (non-building zone) which encircled Paris from the 1840s to the 1940s. This unusual territory, although marginal in a social and geographical sense, came to occupy a central place in Parisian culture. Previous studies have focused on its urban and social history, or on particular ways in which it was represented during particular periods. By bringing together and analysing a wider range of sources from the duration of the zone’s existence, this study offers a rich and nuanced account of how the area was perceived and used by successive generations of Parisian novelists (including Zola and Flaubert), poets, songwriters, artists, photographers, film-makers, politicians and town-planners. More generally, it aims to raise awareness of a neglected aspect of Parisian cultural history while pointing to links between current and past perceptions of the city’s periphery. 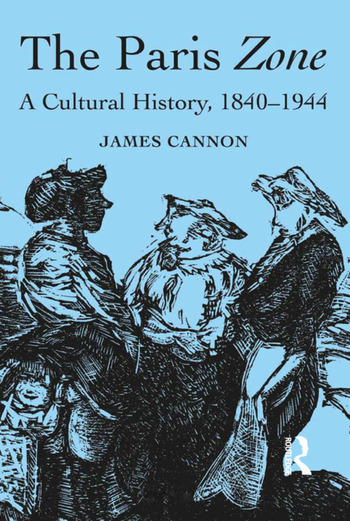 James Cannon is lecturer in French Studies at La Trobe University, Australia. His research interests include 19th and 20th-century French cultural history, the history of French popular song, the history of Paris and Vichy France.